The siding is finished and ready to start the roof. This is part 2 of the article on how to build a shed from an old cedar gazebo. 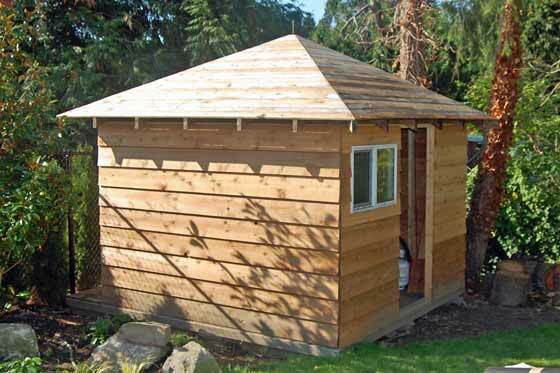 The information is based on converting my neighbour’s old cedar gazebo into a new garden shed for me. I used the bones from the gazebo to build a shed. Well it was more than the bones. It included the floor, corner posts and the roof structure. Part one was more related to moving the gazebo and framing the new shed from the gazebo. Part two is less about the converting the gazebo and more about constructing the garden shed. So you may find part two more useful if you are building a shed from scratch. Steps we followed to put the siding the shed. For siding the shed I decided to used bevelled cedar siding. I’ve installed this kind of siding before and I like the way it looks. Also, it is naturally resistant to pests and rot. We also have several local sawmills that produce good quality cedar siding at a reasonable price. I went to Surrey Cedar to get the siding. They have good prices and knowledgeable staff. The first step was to purchase the cedar siding. When selecting the siding you want to check the ends of the boards to make sure they are not cracked. You may see this if you are purchasing a lower grade of cedar or their stock is low in the wood bin. If this is the case go through the wood pile and pick out the best wood. I had to get longer pieces and then cut off the cracked ends. I did get a deal on this wood because of the spoilage. Cut the boards to the correct length. We measured each board because the posts were not perfectly parallel. Nail the first board on the bottom with the thicker end on the bottom – make sure it is level before you nail it in place. Determine the overlap you want for the 2nd board, make sure it is level and then nail it in place. We then made two guides based on the distance between the 1st and 2nd board. You can see this in the middle photo above. Then it is quick to check each board and nail it in. We used two guides on eitehr end so we could make sure the board was level. Keep adding boards until you are at the top. You may have to cut the last board down a bit to fit in. Nailed down the starter row and the first shingle. I decided to go with asphalt shingles for the roof. This is because it is easier and cheaper to install than cedar shingles and we are planning on replacing our existing roof with asphalt shingles in the near future. Always something to do if you are a home owner. Since the gazebo had a cedar shingle roof, we removed all of the shingles before we moved onto my property. The gazebo already had the sheathing on the roof and it was in really good shape. To prepare the roof deck for the shingles I just needed to remove long strips of wood that the cedar shingles were attached to and then remove some nails that were left over from the wood strips and shingles. If you are installing a brand new roof, you will need to put down plywood, also called the sheathing, to nail the asphalt shingles too. The first shed I built had a gabled roof and this is a lot easier to roof. You just need to nail down the shingles, ensure they are overlapping and then cut off the ends. Okay, that is pretty simplified. With the pyramid style of roof on a gazebo it was a lot more work. This is because you have four sides that are getting smaller and smaller as you go up the roof and you have to take into account they overlap on the sides. So there is a lot more cutting involved and you need to cover the four ridges. On the positive side, the roof looks great and there is a lot more usable height inside the shed roof. I was able to store my patio heater in the shed this winter. I rolled out the felt, cut it to size where necessary and stapled it down to the roof. This is also called underlayment and you want to make sure it is overlapping. I did this on the entire roof. Note – for a pyramid or hip style of roof it is important to roof one side at a time. On the bottom edge of the roof, put down the starter strip. The starter strip should overhang the roof by 1”. You can purchase a starter strip or just cut the tabs off a few shingles and then nail them to the roof. Save these tabs for the ridge cap. Some people will put down a chalk line to make sure the shingles are straigth, but as you can see from the picture the underlayment had lines printed out it that we could use. Start the first row of shingles on top of the start strip. Each manufacture will have their recommended way to nail down the shingles. I recommend that you read the information on the shingle package or talk to a representative from where you purchase the shingles. You want to make sure you get this correct. Nail down each row as you move up the roof. Make sure the next layer covers the previous row as required by the manufacturer’s instructions and that you do not line up shingles. I like to line up each second row then you know you are correctly covering your roof from the elements. Trim the edges that are overhanging. We first started using a utility knife and then got a hooked-blade utility knife. You can replace the hooked blades with a straight blade and it made this work a lot easier and the cuts were a lot easier. Well worth the money to purchase them. Use a ridge cap or the left over tabs that you cut off earlier to cover the seams on the four corners. 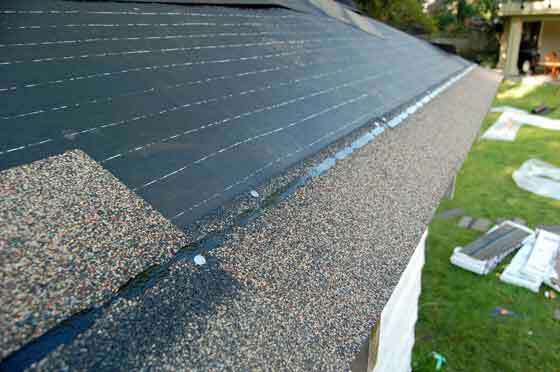 You want to make sure you cover each ridge cap with the new one you are nailing down. You will probably need to cut more tabs off the shingles to have enough ridge caps for the four seams. I like to stain cedar with a natural color, but this time I was over ruled and we sealed it with paint. The color of paint we picked was similar to the color of the siding on our house. Which I think was a good idea. The door was a different matter. Leanne wanted a purple door to make it stand out. As you can see from the photo I think mission was accomplished! I guess there is not a lot to say about painting the shed. First we primed it with an outdoor primer and after it tried we painted it. I like painting because you can see your progress, but painting a 10×10 shed in the hot sun is a lot of work. TIP – You want to have the rough cut on the outside of the shed. This allows more paint to absorb into the wood and protect the wood longer. I did purchase cedar boards to trim the corners of the shed. I pre-painted boards with a primer and then white and will install them this spring. Construction of the door for my new shed. I’m very lucky that my neighbor really enjoys working with wood and has a small sawmill. As you can see from the photos above he handcrafted the new door. He used wood that he had milled with the sawmill he made. We were looking for an old fashioned looking barn door and I think he delivered it! Old fashioned wrought iron hing for our shed door. To go with the old fashioned barn style door we wanted to use old style wrought iron hardware. I searched online for a while and finally found the perfect hardware from Lee Valley. Since it was made with wrought iron the hinge was a bit stiff, but once it was installed on the door there was no problem opening the door. This is one heaving door. We cut notches in the door frame so that we could make the door flush with the shed siding and attach the hinges. We installed shims for the hinges to mount too. This is the lighter colored wood in the photo above. Once we were happy with the door installation, I painted the shims the same color as the shed and they blend in perfectly. The last thing to do is to mount the corner boards. I have them all pained and ready to go. Once that is finished I will update this article and post a picutre below. For now if you want to see a picture of the finished shed you can go to the top or part 1, by clicking on converting a gazebo to shed. If you can provide any tips on building a shed or you have any questions, please leave a comment below.